Our new pond is proving to be a source of endless fascination. I created it last summer and bought aquatic plants that needed to be brought into the house to over winter. I put them back successfully at the end of March and now they are taking off with the warmer weather. The pond has been quickly colonised by all sorts of interesting bugs, a couple of frogs and at least one sizeable newt. Today some dragon flies turned up, stayed around the pond area and appeared to be mating. All this is entertaining, very enjoyable and relaxing. I think building a pond would prove to be a good method of reducing and managing stress. It can be creative and provide a sense of achievement. It doesn’t sound riveting, perhaps, but it can be and often is. 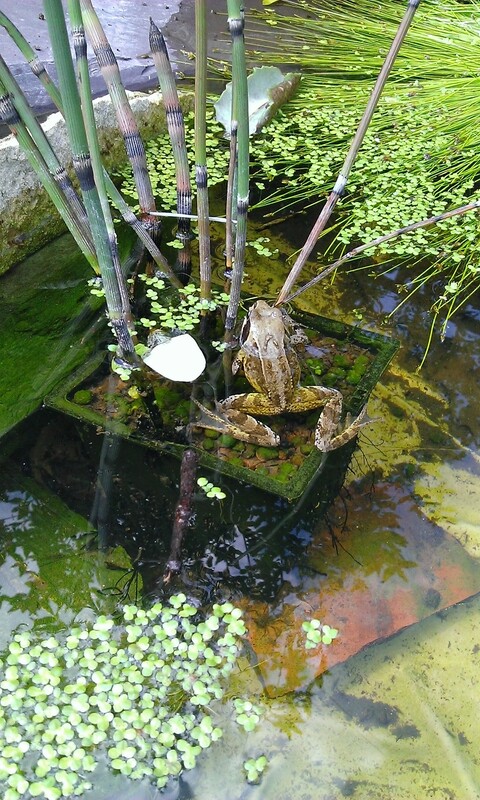 You’ll gain respect for the smallest of pond creatures and feel excitement when you spot the larger ones. And you can claim maximum mindfulness points! I went for a long run yesterday, training for the new Flaming June half marathon, which is local to me, in Impington.My training regime is to carry on running as I would normally do but add 3 x 13.2 mile runs in the month leading up to it. I did the first one 5 days ago and perhaps I should have left longer time for recovery. I feel tired today but not overwhelmingly. Tomorrow I’ll do parkrun and on Sunday I’m running a 7.7 race at Willingham, a village about 6 miles away. A couple of days ago, BBC news posted an item on their website concerning the possible effects of endurance training on the heart, particularly with reference to older runners and triathletes http://bbc.in/1kfomk2 Apparently intensive and prolonged training, and the consequent lowering of the heart beat down to 30 per min and lower, can result in dangerous heart arrhythmias. Previous research has indicated that intensive training can stress the heart by causing multiple small tears to the heart muscle leading to recommendations limiting exercise to around 2 to 2.5 hours per week. I seldom see any reference to people who already have diagnosed heart disease or have experienced a heart attack. After my heart attack 5 years ago my cardiologist saw no reason why I shouldn’t run another marathon. When I checked out current thinking with the cardiac rehab team 6 months ago, the advice hadn’t changed. This entry was posted in cardiac rehabilitation, creating ponds, excessive running, Exercise and heart disease, parkrun, Running, running races, running with heart disease, Uncategorized and tagged exercise, heart disorder, parkrun, running. Bookmark the permalink.